Patients who have lost a tooth have several options for replacement. From dentures, to bridge and crown appliances, to dental implants, patients can choose the option that best fits their needs. Improved speech: Because the metal rod is inserted into the jawbone it is stable. The crown will not slip or cause a change in patient’s speech, as some other tooth replacement options might. Easier eating: Dental implants will function just like your natural teeth. Patients can eat their favorite foods without worrying that they will slip or get food particles stuck underneath them. Improved self-esteem: When a tooth is missing, a patient’s confidence can suffer. 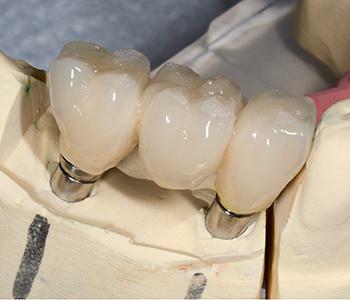 The dental implant and crown will look exactly like the natural tooth and give the patient a great smile. Good oral health: Some replacement tooth procedures require removing tooth structure of the nearby teeth to make room for a crown that will hold the bridge or denture. However, with implants, the surrounding teeth are not adjusted, which protects the health of your mouth. Long-lasting: Caring for your implant is easy – brushing, flossing, and regular checkups will keep it in good condition. Patients should also take care to avoid biting into hard items such as ice, sourdough pretzels, or chewing on pens which can cause the replacement tooth to chip or break. With this proper care, dental implants can last for a patient’s lifetime. The Bingham-Lester Dentistry team is committed to helping patients through the tooth replacement process.